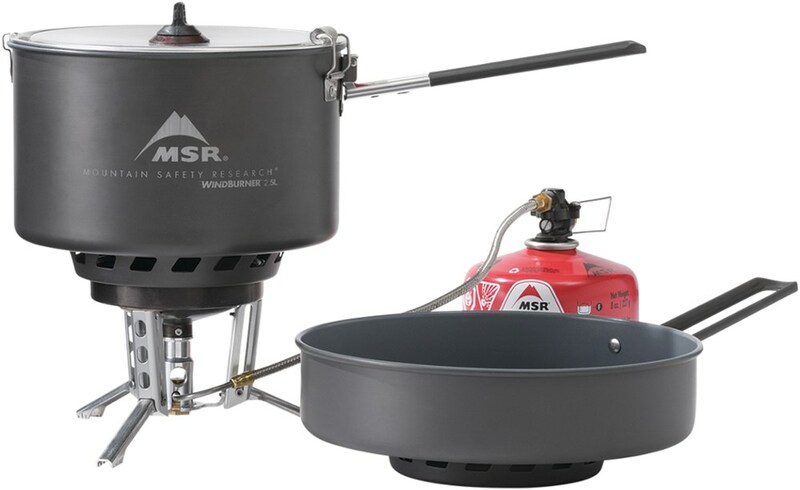 MSR's WindBurner Stove System uses the same radiant burner technology with built-in heat exchanger that powers the Reactor stove. But, unlike the Reactor, which is meant for group use, the WindBurner is designed for personal use in punishing conditions. 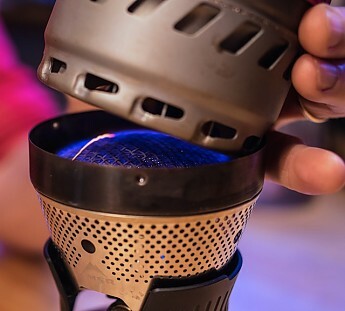 The WindBurner promises "easy usability, superior boil times, and unmatched fuel efficiency in real-world conditions." MSR says it can boil 0.5 liters of water a full minute faster than the leading competition in a breeze. And, that in a 12-mph wind, it boils in 2:45, while the competition fails to boil, no matter the amount of fuel used. 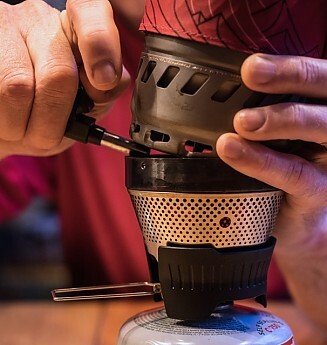 Built for one to two backpackers or alpinists, the WindBurner system features a handheld design; the compact pot twists onto the windproof burner for a secure, non-slip fit. When it debuted in 2014, the stove was originally called the WindBoiler, but its name was changed in later 2015 to WindBurner. Same stove, slightly different name. 100km p hour winds — no problems. Back from a 2-day backpacking trip with this new stove. I took an almost exhausted gas cylinder (20% left). I did 4 boils of 240ml of water and the gas is still not exhausted. Boil time was 2 minutes in up to 100 km per hour winds. The first time I started it the flame blew out before I loaded the pot / heat exchanger assembly on the stove. After this experience I learned how to keep the lighted match on the stove (waterproof matches are also WIND proof!) until the last moment before mounting the pot exchanger assembly. Once the assembly is in place this stove is simply impervious to wind. Performs as advertised. Therefore very hard to fault. Ideally to avoid the lighting issue (which is solvable as I said above), you could build a piezo starter into the pot/exchanger assembly base and then presto! But this would probably add to weight and expense to make it reliable and long lasting. My experience with other piezo stoves has not been good. So all in all an excellent little windproof stove. Oh! others have commented on the tripod mount for the base. Make sure you use gas cylinders that are the correct diameter! Then no probs. I ended up buying an all metal MSR canister tripod stand to replace the plastic one supplied with the stove. The plastic one that comes with the stove WILL break eventually. Mine hasn't yet, but I prefer to use the metal one. both are adjustable for different sized gas canisters. The metal one has a spring loaded slider which is far better than the plastic one which just has two sets of fixed slots. It would be preferable to have a stand that accepts all types of canisters, since not all retailers carry the MSR ones. 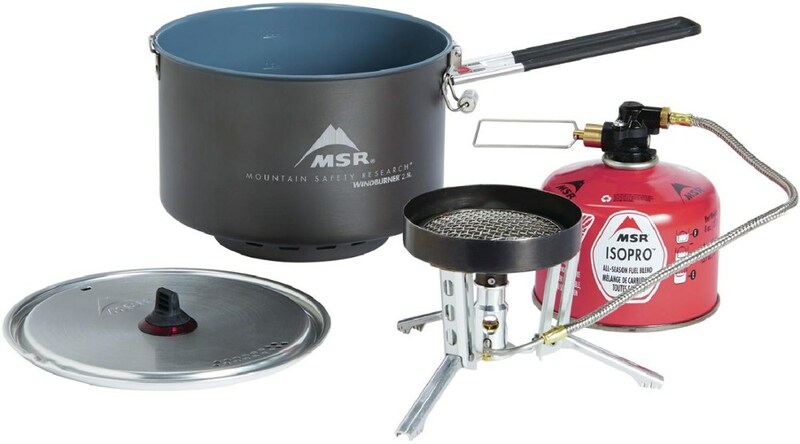 MSR's own Universal canister stand does this at a slight weight disadvantage, but will not pack into the pot with the rest of the stove. I think they can do better. Some comments on your review and your criticisms of Big Red's review - There are 2 diameters of the 3 standard sizes of compressed gas canisters (butane/isobutane/propane mixes) that have the industry standard threaded coupling (Lindal valve). 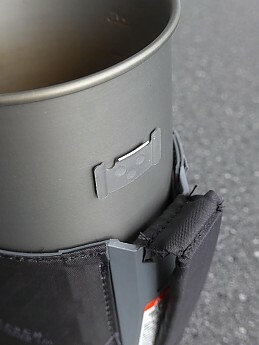 The plastic stand available from JetBoil and MSR has 2 sets of notches (which you can see in one of Big Red's photos. You can clip onto either of the 2 diameters of canisters with either stand. 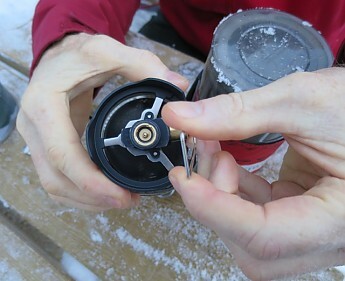 There are other canisters out there, but they do not use the standard threaded coupling and cannot be attached to the Snowpeak, Jetboil, MSR, SOTO, Primus, or numerous stoves using the threaded coupler. The old (now discontinued) Camping Gaz Bleuet canisters that have a Lindal coupler lacked the threaded coupling. Most of those stoves can be attached to any of the 3 sizes (100, 230, and 450 gram weight of gas when new). 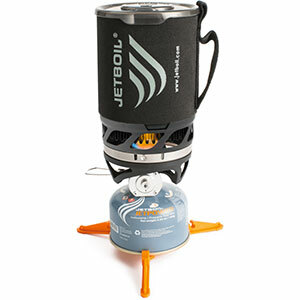 The notable exception is the JetBoil Joule, which I reviewed recently for the Trailspace Gear Review Corps. In the Joule's case, the problem is that the mounting frame allows mounting the 100 and 230 gram canisters, but does not allow fitting the 450 gram canisters inside the frams (the content weights of the canisters differ slightly among the different manufacturers). I have a question on a statement in your report that calls for a clear answer - you give a boil time for the Windboiler and state a windspeed. Leaving aside the problem of lighting the stove in high winds, how did you measure the windspeed at 100 kph? I normally carry a calibrated wind speed meter in my research expeditions for the American Climber Science Program. I have found that most people far overestimate wind speeds unless they directly measure the speed with a calibrated meter. A 100kph wind is very difficult to impossible for most people to stand up in, and will blow over most stoves unless sheltered. 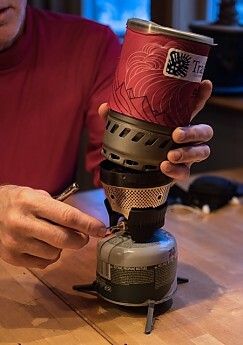 I do not doubt that, once lit, the Windboiler will keep the flame lit and heat directed onto the pot via the screen and heat exchanger (the JetBoil Joule has a similar arrangement, which I have used in very high winds). I am also curious what method you used to light your Windboiler in the high winds. As Big Red said, this can be a serious flaw with the Windboiler. I should have noted that the 230 and 450 gram canisters are the same diameter, while the 100 gram canisters are a slightly smaller diameter. Winds always fluctuate. The peak wind speed I was working in was 100 km per hour plus and moreover I can PROVE it. I was camped not far from Thredbo Top Station and it has an official Australian Weather Bureau station there. I was about 1000ft above this with higher winds. They clocked max gusts at 100. What you say is true. At 100 ks it is difficult to stand up. Exactly so. The first time i tried to light the stove it went out. That's when I used my head. Kept the waterproof lighted match on the burner till the last possible moment. I kept the lighted match on the wire grid; lowered the top assembly over the match and then simultaneously withdrew the match and lowered the assembly. That gap before lowering was less than 1cm. Note: waterproof matches don't blow out. Bingo! It worked. Make sure the stove stand matches your gas cylinder sizes - is all I am saying. I was using those waterproof matches where the combustible material extends along almost half the match head. I should make a video of the technique. Its not so difficult. Also in gusting winds you do not wait for the maximum wind speed to light your stove. In fact you do the reverse. My bottom line is that with proper lighting technique (required of any stove) this is a super high wind stove. Use waterproof matches however. Without them life would have been very difficult indeed. The MSR Windboiler is a one-trick pony — it boils water efficiently even in high winds — and it does that one trick extremely well. But lighting the stove in those same winds is not so easy, and the plastic canister stand is rather fragile. I received this stove in late October as a Review Corps assignment. 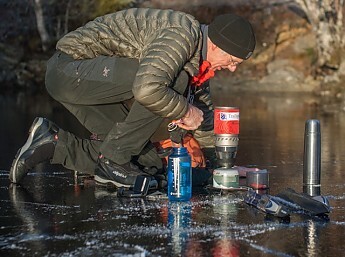 As I live in Norway, I have mostly used the stove in relatively cold conditions, including cool (10˚C/50˚F), windless conditions in my back yard, in a moderate breeze while out ice skating, in near-freezing and very windy conditions on a nearby hilltop, and most recently in a light wind at -10˚C (14˚F) on a 1500 m (5000 feet) mountain top, among other outings. 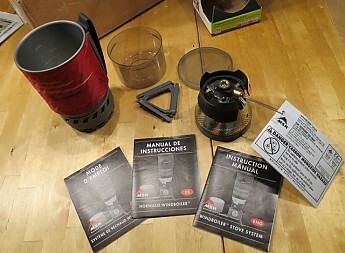 The kit includes the burner head, a (nominally) 1-liter pot with cozy and handle, a tight-fitting sip-and-strain lid, a smallish bowl that protects the pot base when in the pack, a folding plastic stand for a gas canister, and a little square of pack towel material that helps protect the inside bottom of the pot when packed. All of this weighs in at 472 grams or just a hair over one pound, and fits into a compact, cylindrical 17.5 cm (7 inches) high by 10.5 cm (4 inches) diameter (at the top where it is widest) package, with room left over in the pot for a small 4 oz. fuel canister. Bigger canisters will have to find their own place in your pack. Let’s start with the last item—the plastic stand. It took about 30 seconds out of the box to break one of the hinges by trying to rotate a leg the wrong way, in the horizontal rather than vertical plane, the latter being the way that my metal MSR Universal Stand works. Call me an idiot, but the stand is clearly not idiot proof, and I imagine it could break just as easily if the stove assembly is dropped or inconveniently leveraged in some way. I managed to repair the stand with a screw and washer so I could try it out anyway. It is designed for a tight, snap-on fit to the canister base that involves a slight stretching of the plastic, and the legs can pop off without breaking when assembling or disassembling the canister and stand. Given its demonstrable fragility I don’t feel that I can rely on it for regular use. My old metal stand is much sturdier and has a wider footprint, but won’t fit inside the pot. 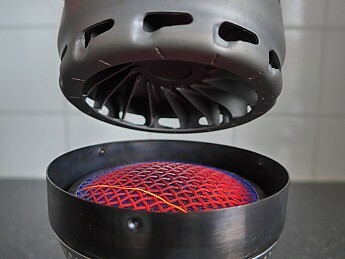 The burner head itself is a thing of beauty and ingenuity, from the light gauge stainless steel windscreen to the radiant screen that glows artistically red under the blue flame when the stove is lit. 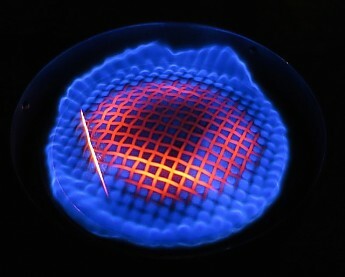 The conical shape of the burner and molded plastic base give it a kind of hi-tech, rocket-engine look. The ignition indicator wire running over the screen looks rather delicate, so in general it seems advisable to avoid rough treatment of this part of the stove. The molded plastic base serves to protect the canister mount and valve assembly when set on a hard surface. Problems with the stand aside, assembly is simple enough. You have to remember to rotate the valve control out before threading on to the canister — this idiot forgot to do that the first few times — or you will have to take it apart again to rotate the control into position. 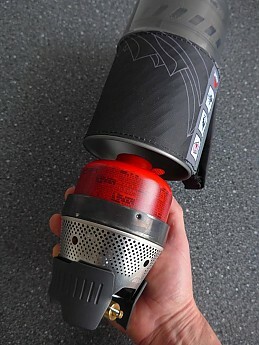 If you have a one-handed Bic-type lighter, starting the stove in low wind conditions is also simple, with one hand on the valve and the other on the lighter to spark above the screen as soon as the gas starts to flow. But if you use matches or a steel using two hands, then you have to turn on the gas before striking, and I think this is the stove’s weakness. As it gets windier, you need a hand to shelter the burner head as you try to light it, it gets harder to get the stove to catch on the first strike, and a good stiff breeze can blow the stove out again, so you can vent a fair bit of gas just trying to get the thing lit. It seems to me the system would be a lot more wind-resistant if it had a piezo lighter or maybe some kind of port that allowed you to light it with the pot already in place. Then there would be almost no wasted fuel at all. As it is you’ve got a stove that works flawlessly in wind, once (if) you can get it going. The manual provides no specific instructions for lighting in wind. The manual specifically warns against lighting the stove with the pot in place or putting the pot one before the screen and ignition wire are glowing red, which only takes a few seconds. I tried it anyway, with the pot propped at a slight angle so I can light it through one of the holes at the base of the pot that are normally covered by the burner, using a butane lighter with a piezo sparker at the end of a short tube to get a little distance. But it doesn’t seem like a good idea to adopt this as a regular practice. Instead I worked out a lighting method that involves holding the pot at an angle on the upwind side with one hand, while using the other to turn on the gas and then try to quickly light the burner. 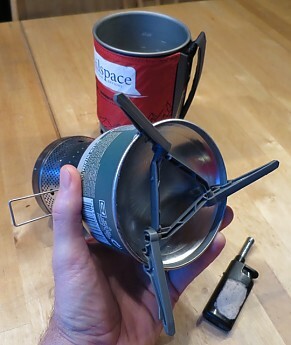 I haven’t yet tried this in full-on wind, and at any rate I think it’s up to MSR to develop and communicate a safe and reliable method for lighting the stove in wind since that is an intended use. Ever since the revelatory introduction of the Whisperlite, noise level has been one of my criteria for judging a stove, and this one does well, allowing normal-volume conversation in its general vicinity. For me this is a good selling point. The pot drops on and locks on to the burner with just a little twist, with no need to fiddle to find the right position. From that point on the system is pretty bombproof. It will boil 500 ml of water in not a whole lot more than the promised 2.5 minutes even in a stiff crosswind at 0˚C. In that department the Windboiler probably has no equal. The metal that the pot is made of is not stated anywhere in the user guide or website, but it is very light and stiff; the pot with cozy but no lid weighs 208 g (7.3 oz). 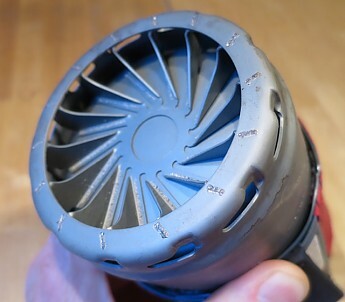 The spiral heat exchanger fins in the bottom of the pot are well-protected, but it might not take too much of a dent in the bottom rim to compromise the fit and lock to the stove. 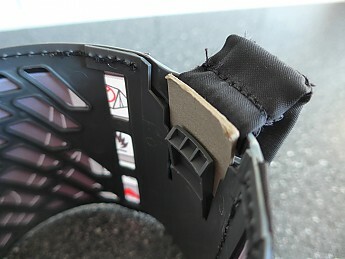 The plastic protector/bowl will help prevent this when stowed away in a pack. 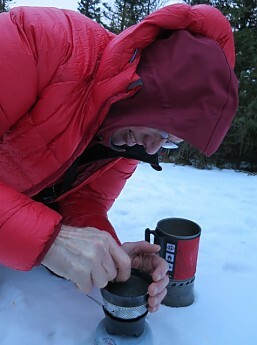 You also don’t want to set the pot down in snow before putting it on the stove, because it can pick up a lot of snow between those fins, so it’s best to set it on the lid or something else dry; the protector/bowl is a tight fit so it’s a bit inconvenient to have to take it off at the last minute. I said the pot is nominally 1 liter because there is a maximum fill line marked on the inside at 600 ml. I think that’s probably an expression of the abundance of caution required for sale, in the U.S., of just about anything an idiot like me can use to hurt himself in some imaginative way. About 1/3 of the printed area of the user guide is devoted to fine-print warnings. A not-too-idiotic user could probably get away with boiling up towards a full liter without any real risk of self-immolation. 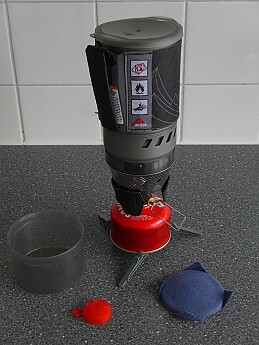 At present there are no other pots that fit this stove, so it really is a personal stove system best used for hot drinks or freeze-dried food cooked in the bag. Boiling enough macaroni or spaghetti even for one hungry hiker would be a challenge in that small a volume, strainer lid or no. It is big enough to reach inside and scrub even if you have big hands like me. There are rumors of bigger pots on the way, but, as they are not available yet, that is beyond the scope of this review. With the cozy, handle, and sip lid, the pot can be used as a big mug. Without the sip lid on I found the rim rather hot at first but otherwise the pot is a nice handwarmer. The thin cozy works surprisingly well at keeping contents warm. The lid is a nice tight fit and won’t come off easily in the pack, but the cozy can ride up and make it a little difficult to snap the lid on. The 470 ml (16 oz.) bowl is characterized as “full size” but it seems a bit small to me; I think I could eat three or four fill-ups for an evening meal, especially if it involved pasta. Yikes! The field resettable feature is a big advantage over the Reactor, which has to be factory reset, but either way one hopes it is not necessary. It’s generally accepted that upright canister stoves are not a good choice for cold conditions, i.e. temperatures near or below freezing, because the canister will self-cool from evaporating gas, that more volatile butane will vaporize first, and the heavier gases can become too cool to vaporize properly. Having said that, this stove performed fine on a half-full canister at temperatures around freezing. It’s when you get towards the bottom of the canister that problems arise. As with other “personal stove systems” and many alcohol stoves, the Windboiler is all about boiling water fast and efficiently and not really suitable for more complex cooking tasks. If wind performance is not a major concern for you, there are cheaper, lighter and/or more versatile stoves that will boil water at similar rates or efficiency. 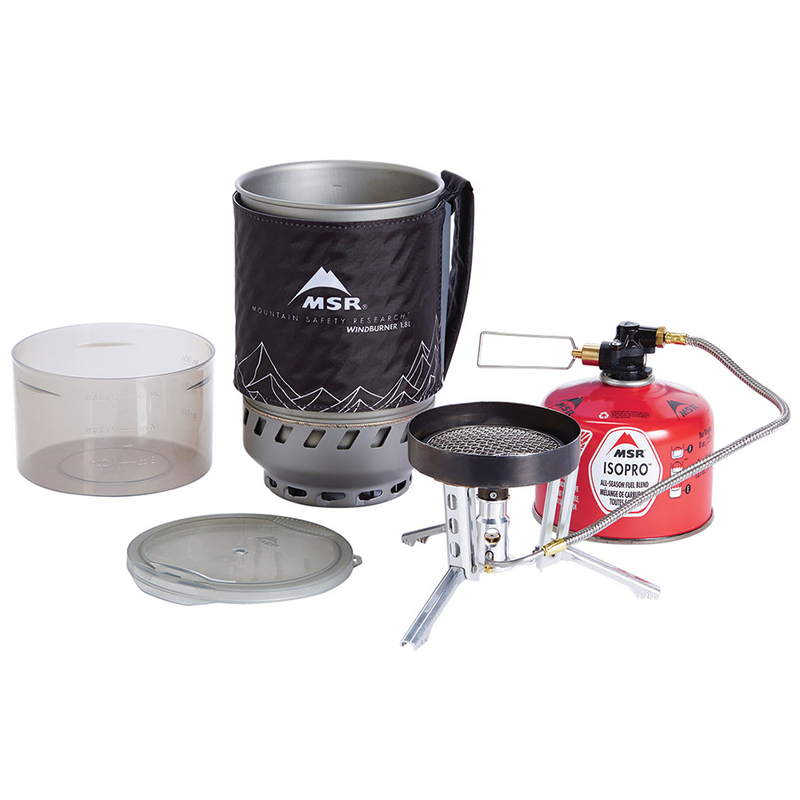 If you’re planning on camping and cooking in windy environments and are content with freeze-dried or home-dried cook-in-bag meals for one or at most two people, then this highly specialized stove is a good choice. You can upgrade that to an excellent choice if you, MSR, or anyone else can figure out a reliable, no-waste way to light it in the windy situations that are otherwise its main advantage. While the details of this system are extremely well thought-out and it functions as promised in high wind, the fragile canister stand and the lighting-in-wind problem hold it back from full marks. Nice review, Big Red. The cheap pot stand reminds me of MSR's "Foon," a complete waste of plastic. I'm surprised items like that make it past their internal testers. Nice review, Big Red. 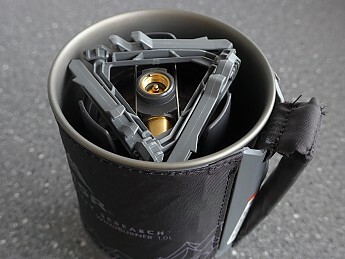 I've had similar concerns with the canister stand on my JetBoil GCS. No breakage yet, but at any given moment, it feels like it may snap. They appear to be almost identical in design. I've never been a fan of this style stove anyway -- this apparatus seems especially futzy. Great insights particularly about the lighting. Nice review, Big Red! Those are some great pictures too. Thanks for testing out the Windboiler. Any idea the mph you were able to boil in and/or how long it took? I hope you'll keep us posted on how it continues to fare (if you continue to use it). Helpful review, thanks BigRed. I bought one of these a little while back but haven’t yet had a chance to take it out. I have another brand (much lighter) canister stove which works great although boil time (and fuel consumption) is impacted by even a light breeze, so I figured the Windboiler would be an interesting experiment. You mentioned some legitimate concerns, so I’ll just have to see how it works out for me. And I’ll be careful with the plastic stand :-). An insightful review Big Red, I don't own a stove of this type but have used them before and you are right, it is a "one trick pony". Of course if that is the only trick you need the pony to do then it is a good choice. I'd guess the wind was in the 15-20 mph range on the windiest day I tested it. Getting it started was not easy, but I managed it eventually. We've had very little wind of late, the opposite of a year ago, when we had an October wind event of a couple of hours big enough to be dubbed Ivar, that knocked down patches of trees all over the forested area above my house. It took a lot of the mostly snowless winter to clean it all up via salvage logging. Then it seemed every time it got cold enough for the big reservoir to freeze over for some ice skating it blew like hell and kept the big lakes open. I could have really put the stove through its paces on some of those days. Thanks for this great, detailed review! A very nice review. I tested one in much higher winds, and it did great. I didn't have too much trouble lighting it, but I was using a fire steel to light it. That said, it would be nice (and more efficient) to have a built in ignition. One quirky thing happened with a firesteel -- the stove went into "underburn" where the flame went below the surface of the burner. No big deal (just shut off the stove and try again), but I wonder if you ever encountered anything like that? I'm not sure whether or not underburn is something that just happens or I've got a weird burner. Hi Jim. I have not experienced underburn. I read all your blog entries about the stove. It sounds like you also put it through its paces. I suppose a step puts out a hotter spark but I'd rather a have some kind of one-handed lighter so I can have the other on the valve or holding the post as a kind of windbreak as I showed in the photos. I'll keep working with it, may have some edits later. OK, thanks. I did an experiment after I got a spontaneous underburn. I tried to set up what I thought would be conditions where I would get underburn (typically it happens when you restart a stove when it is still hot). Out of maybe 50 tries, I got one instance of underburn. So, it doesn't look like it happens often, and no one else seems to be reporting it. Just thought I'd ask. Sensationalist review. I don't like click bate. @Denis-your comment confuses me. BigRed knocks this as a "one-trick pony," points out several flaws in the stove, and only gives it 3.5 stars. I'm not sure what you meant. I've given my review below. In my humble opinion Big_Red exaggerated minor easily circumvented issues. Number of times he stated and I quote: "Not for Idiots". I just do not understand?? Anyway, see my review below. For the stand: there are at least 2 diameters for MSR gas canisters. You can force it to hold the larger wrong sized canister but I wouldn't do this in cold weather. It is unfortunate that canister sizes are not uniform. That is not an MSR problem its an industry problem. With this stove, if you want to use the tripod stand only use the small diameter (same capacity!?) canisters! Great review, Red! I've been very interested in this stove, so I am very glad to see this informative review! Sometimes a great review is critical. If a stove is not good, then a reviewer ought to say so. I think Big Red's review is a good one. SO much better than the crappy reviews I read elsewhere that are either superfluous fluff or a regurgitation of the stove company's ad copy. I think you guys are nuts! 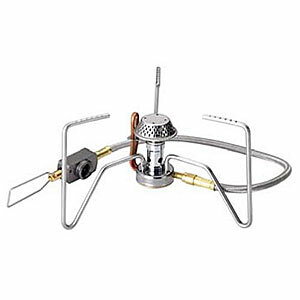 This is the best high wind stove I have ever used. That's what your readers need to know. Period! 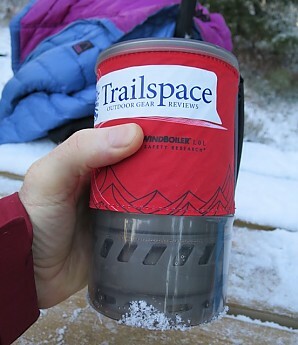 @Hikin_jim, if you're willing, we'd be glad to have your review on Trailspace as well. This absolutely elementary and easy method to light this or any stove in the wind is to use waterproof and therefore wind proof matches. Do not use flint striker lighters. Hold the match on the burner till the last moment as you lower the top assembly. You cannot criticize a stove because of user error! There is nothing wrong with this stove. Although the debate on this stove is a bit "heated", I think the comments persuaded me to read additional reviews which was very helpful. Denis, I like how you've troubleshot the stove's weaknesses. I also enjoy the frank discussion of the factory flaws by Big Red. Thank you. Nice compact and efficient system, some quirks need to be addressed. I have used this stove on a couple of trekkings and one vacation now, sometimes carrying it in my backpack along with a tent and so on. So far I have used it for making tea, either for breakfast or to carry along in a thermos bottle. In the future I may use it for heating water to apply inside the bag of a dried meal. That might include melting snow. I am curious how that would turn out in cold and on altitude. When using a 100 g cartridge, it is one compact cylindrical package which I can easily shove into my pack along similar items like a tent. That is a major advantage compared to the bulky pan I used previously, combined with either a gasoline or gas stove plus their bottle or cartridge. Of those stoves I could only put the gasoline one inside the pan, if I did so because to avoid spillage I sometimes kept that connected. So, when using that 100 g canister, I really have all in one, except for a lighter. The weight probably is less than any of the previous configurations I used, but I have not measured. Efficiency of burning, which should be a lot higher because of the build in wind shield, the heat absorbing fins underneath the pot (picture), the insulation around the pot, and the lid on the pot. Number one without a doubt is the beaker getting stuck after been put around the base of the pot. It really drove me out of my mind not to be able to use the whole damn thing because of that. I have even been pulling on both ends together with someone trying to get it off. Imagine that on a freezing early morning being in a hurry. I have adapted the beaker by cutting off the three lips inside the beaker as far as I could (picture). That should help, but be aware they may still get stuck unexpectedly. The lips get stuck when the beaker is really pressed on the pot and the lips catches over an edge. That may or may not be prevented by the mantle and the lid on the pot. So as a little advice when assembling: take off the lid to get a bit more clearance. Then squeeze around every one of the lips to force it outward a bit (picture), trying to wriggle the beaker off. Yes, this is still far from ideal. The insulating mantle easily gets off after a while. It should be held by a lip on the mantle clipping above one on the pot. But it gets too much clearance to keep working (picture). For the time being I can block that by inserting a piece of cardboard (picture). I probably will replace that by plastic. Lighting the stove in wind may be tricky because the fire pit is completely exposed when lighting. Try to find shelter or to shield it some other way. The glowing thread above the fire pit is really handy (picture). 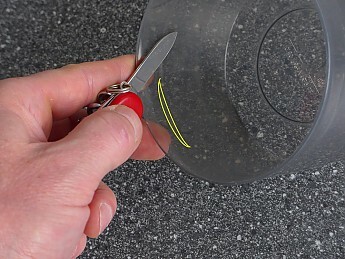 Be aware the plastic stand is useful put cannot resist to much force, like when pressing the lid on the pot. When disassembling and putting a 100 g cartridge inside the pot, better keep the cap on to prevent damage inside the pot. There seems to be only one way to get everything in, including the stand: cartridge top down underneath the stove, separated by the felt, then the stand falling into the void of the stove base, finishing with the lid. It is a tight squeeze, a lighter won’t fit anymore (picture). Best is to stack the cartridge and stove first, then shove it in horizontally in the pot (picture), or put the pot over it instead of dropping it in the other way around. Thanks for the review, Capricorn! I bought this stove for one purpose... to boil water high up in the backcountry in cold temps and driving wind, and this product excels. 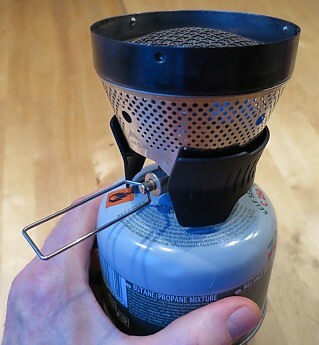 After years of frustration with my super light backpacking stove, I had enough and started reading reviews online about stoves that would stay lit in windy conditions. The Windburner stood out in the reviews and I pulled the trigger. This thing is amazing.... My number one priority is to boil water quickly in windy conditions in the Sawtooth mountains and the Windburner just excels at its intended purpose!! Sure it's not super light, just go to the gym more often and quit complaining. The lid has a bit of a goofy fit, although it doesn't leak or come off, and it takes up a fair amount of pack space, but the nesting design is brilliant and MSR uses the internal space to its fullest potential. There is also a coffee press system available for this stove, and it also nests within the pot... great design. The element on the stove is more like one of those mushroom heads on an outdoor patio heater, which is one of the design traits that makes the system work, but as others have said it is hard in wind to tell if it is lit. I have learned to just use my hearing. The stove head makes a bit of a different sound when lit than when it is just distributing gas to the head. At dusk it is much easier to tell because the head will glow. Overall it's not a big deal because it always lights for me on the first strike of my mini-bic lighter, so I just put on the pot and let'er rip. And this thing boils FAST... at 10,000 feet in 10-12 MPH wind I can still boil 14 ounces of water in 2 minutes. 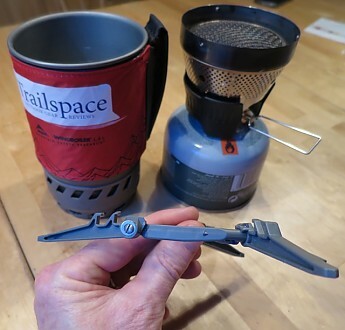 There are a couple of small quirks with this stove as I explained, but the overall design and rock solid performance of the Windburner make it an easy 5-star product for me. Being able to process water and have hot food in just a couple of minutes after pulling the stove from your pack just makes the evenings frustration-free and you can spend more time fishing and enjoying the outdoors. Welcome to Trailspace, Mike! Thanks for sharing your helpful Windburner review. I'd love to see some pictures of yours in action, if you're willing to add them to your review. Good option for windy conditions. This stove is a good option for windy conditions once lit, but as others have said, wind can make it tricky to light. There is no built-in igniter. Also can be hard to see that the burner has been lit, since there's no flame to provide the visual. Easy to set up and use. A bit on the tallish side. All elements of the stove fit inside the pot, including a small canister. Most of my canister stove experience has been with non-integrated Snow Peak or Soto stoves that weigh mere ounces, but require separate pot. Each has advantages and disadvantages and there are numerous reviews of stoves and types of stoves out there. Each has its place. This one is good in wind, but if I don't expect that and weight is of greater interest, I'd take one of the other stoves. Thanks for the review, Alpine1. Do you have any pictures of your WindBurner in action you'd be wiling to share in your review? This thing is great! Fast boiling, efficient, packs well. Setup: Quick, like less than a minute quick. The lid could fit a little better. It is really tight and feels like it could easily come off, but I frequently stuff it in a pack and it always stays put. I also use it to help pour boiling water and it has never come off. Ignition: Leaves much to be desired. I have resorted to leaving a miniature BIC lighter inside so I am always guaranteed to have an ignition source with it. Flame Control: Decent, doesn't simmer as well as some, but I mostly use it just to heat water for cooking or for purifying. Boil Time: I haven't actually timed it. I usually scoop water straight out of a river and heat it up to use in food, that way I'm not trying to drain my water bladder. It's fast though, less than 2 minutes I imagine. It also melts snow really fast too. Fuel Efficiency: I don't cook with it like I said, only boil water. A canister lasts me quite a while. There are lots of variables. Stability: As stable as the surface you put it on. If I have a rock or something to set it on I don't usually use the provided canister stand, but on uneven ground I do just for safety sake. Packability: Beyond being round (weird OCD packing thing, I hate round stuff) It is a very efficient use of space. Everything fits inside, including the gas canister and a tiny lighter or piezo ignitor. Ease of Use: So easy a cave man could do it. Why did they mess around with open fires? Noteworthy Features: Totally windproof, I have TRIED to blow it out and let it get blown out. It's impossible. Construction & Durability: They weak point in the system to me is the insulating jacket. Sometimes it comes off too easy. It is not possible to drop boiling water due to it slipping off, but it does get annoying at times. Also the cup/bowl is kind of exposed, I think that if it were freezing or below and dropped on a hard surface it would crack. The pot and burner itself however are great. 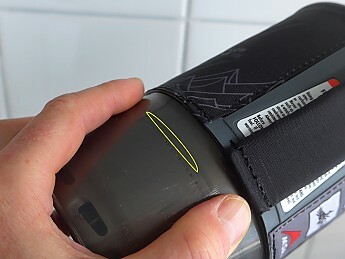 Conditions: I have used this on lots of hikes, day and overnight(s). In the snow it was my sole method of melting snow. I trust it! I also bring it with me "overlanding" (fancy word for car camping but with more crap) in order to make a quick cup of tea or coffee in the morning rather than lighting up the big stove. Nice review, Travis. Thanks for taking the time to share it. Got any pictures of your WindBoiler you'd be willing to add to your review? 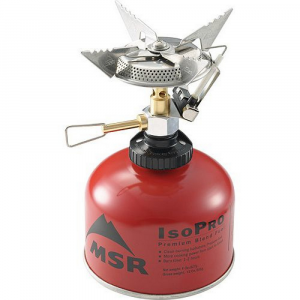 The MSR Windburner won our list of the best camping stoves for 2016! It can be summed up with one word—Spectacular! The closed burner design means it never blows out even in high winds, at altitude, in the bitter freezing cold. This thing just powers through and will have you enjoying a lovely warm cup of coffee before you know it! Boils water at insane speeds, cans of gas seem to last forever, and it lights every time with the click of a switch.